Your Reader Library allows you to access all of the books you’ve ever claimed on the Prolific Works site in one place. 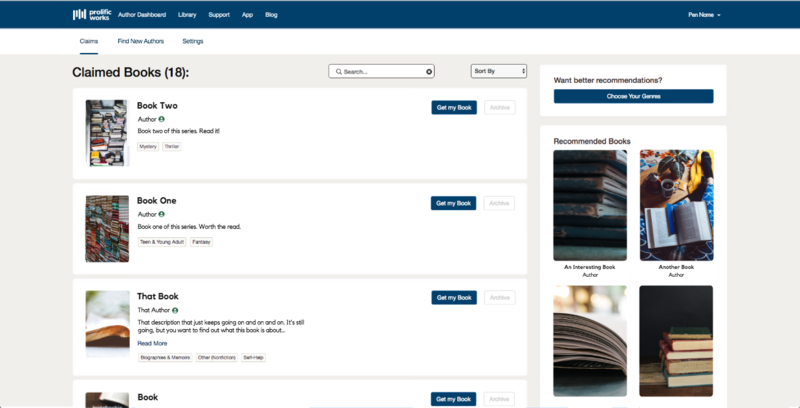 Here you are able to search and sort your books, find recommended books based on the books in your library, and archive books. Follow the instructions below to navigate the Reader Library. If you don't have an Prolific Works account, you can sign up for one here. 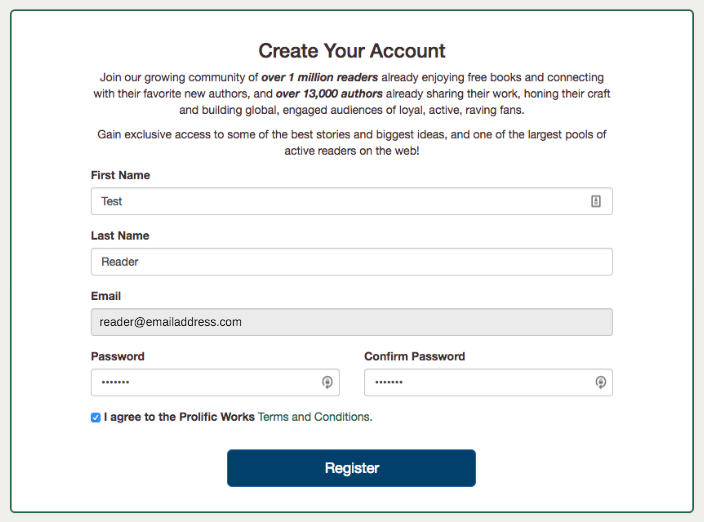 If you use the same email address that you've used to claim books in the past, they will all be waiting in your Reader Library once you log in! Have an account but forgot your password? Click here to reset it. Find a book you would like to claim. If you do not already have a reader account enter your name, email, and click "Claim" to receive your book from Prolific Works. You will be brought to your potential Reader Library where you can download your book or click "Claim Your Account" to see all of the other books you have claimed in the past. 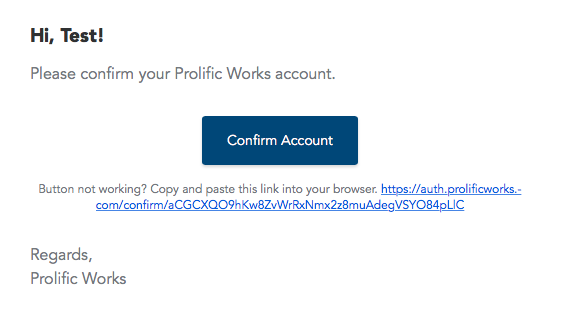 Enter your name, email, and create a password to register for an account on Prolific Works. Make sure you check the box that says "I agree to the Prolific Works Terms and Conditions". Click "Register". You will be emailed a link where you can confirm your account. Click the blue box in your email that says "Confirm Account". If the email doesn't make it to your inbox or the link expires go back to your Reader Library and click "Re-send confirmation email". Claim a book from Prolific Works. To read your book, go to your Reader Library on the top of your dashboard. Click “Get my Book” under the one you’d like to read. A menu will appear where you will be able to download the Prolific Works App to read your book, download a file to your computer and transfer it to your reading device or app, or email yourself a file of the book. If you want to read your book using the Prolific Works app you can download our app from the App Store using an Apple device. If you already have our app the books from your Library will all be there. If your device uses Google Play download the app by clicking this button. If you already have our app the books from your Library will all be there already. If you would like to download a file directly to your device, use the options in the "Download this Book" section. 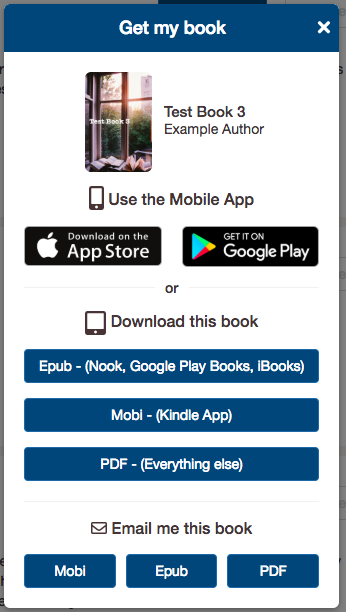 If you want to download an epub file to your computer of phone to send to your Nook, Google Play Books, or iBooks, select “Epub” under “Download this book”. To find out more about adding epub files to Nook and Kobo, click here. To find out more about adding epub files to Google Play Books, click here. To find out more about adding epub files to iBooks, click here. 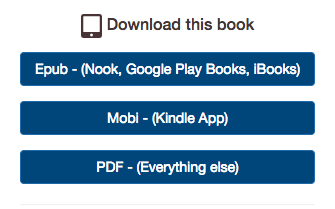 If you want to download a mobi file to your computer or phone to send to your Kindle, select “Mobi” under “Download this book”. To find out more about your options for transferring mobi files to your Kindle device or app, click here. If you want to download a PDF file of your book to read on your computer or anywhere else, select “PDF” under “Download this book”. 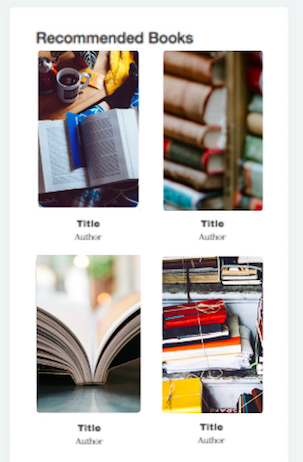 If you would like to be emailed a file of your book, select the button for epub, mobi, or PDF, whichever file type is compatible with your reading device or app. Once this email is sent, you have the option to send yourself another file type. Open this email (subject should be: "Here is your claimed book!"). The email starts by listing the devices and platforms that support the file type you picked. Scroll down towards the end of the email. Here, you can access other available file types after the question: "Want [Book Title] in another file type?". Click on the file type you want. You will receive a new email with your book. 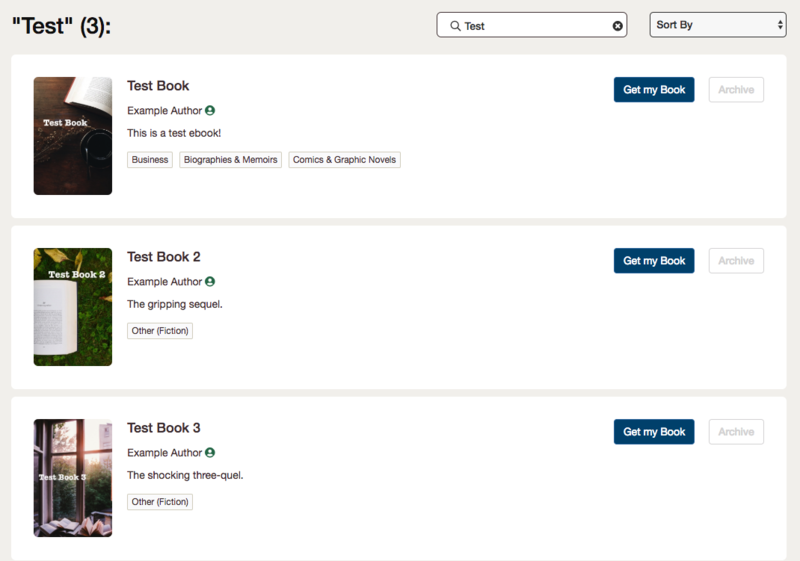 Select the search bar next to “Claimed Books” towards the center of the page. Tap the magnifying glass on the left side of the search bar (or press the “enter” on your keyboard) to search. Results relating to your search should appear below. To leave the search section and return to “My Library”, select the “X’ icon on the right side of the search bar. Select the down arrow next to “Sort by”. A drop-down menu will appear with the options “Date claimed”, “Title”, and “Author Name”. If you select “Author Name”, the books will be sorted alphabetically by author’s last name. If you have more than ten claimed books, you can continue to the next page to see your other books. At the bottom of the page, there is a [insert color] button labeled “Next” towards the right side of the page. Click on this to continue to the next page. If you want to read a book’s entire description, click on “Read More”. This is above the genre tags and below the first three lines of the book description shown. Some books may not have this “Read More” feature since their book description fits in three lines or less. If you want to visit an author’s Page, click on the teal profile icon. This is found to the right of the author’s name, underneath the book’s title. Their author page will be opened in a new tab. Here, you can view their bio, books, giveaways, social media links and author blurbs if they have any. 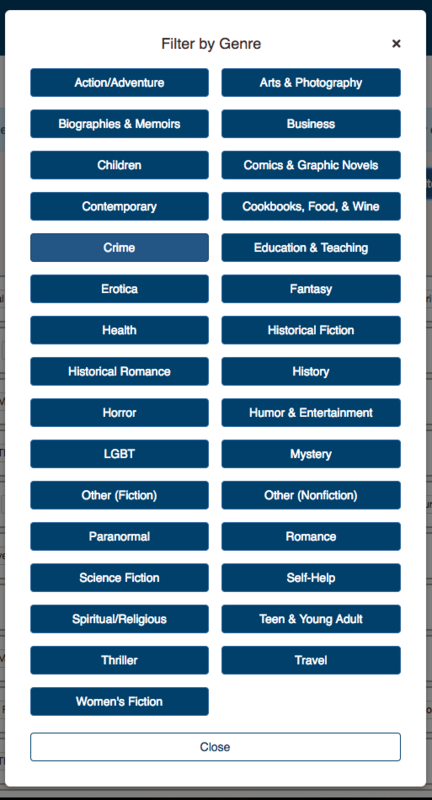 If you want to find authors by searching by genre, click on the blue button. A list of genres will pop-up. Click on the genre you're looking for. You will be brought to a page filled with results. In the case of this example, all authors who labeled "Crime" as their genre will appear on the page. An author's list of other genres are listed next to their name. When you click on the author's name, you will be directed to their profile in a new tab. Here, you can see their bio, genres, social media links (if they have any) and all their free book giveaways. To clear your search history, simply click on the "X" next to the word "Clear" or next to the selected genre. This is found right next to "Results". If you want to find authors by name, click on the search bar. This is next to the "Filter by Genre" button. Press “enter” on your keyboard to search. Results relating to your search should appear below. Again, when you click on the author's name, you will be directed to their profile in a new tab. Here, you can see their bio, genres, social media links (if they have any) and all their free book giveaways. To clear your search history, simply click on the "X" next to the word "Clear" This is found right next to "Results". Click on the box next to "Sort". "Alphabetically (A-Z)" is the default choice. A drop-down menu will appear with the options “Alphabetically (A-Z)”, “Alphabetically (Z-A)”, “Newest First", and "Oldest First”. If you select "Alphabetically (A-Z)", the authors will be sorted in alphabetical order from A-Z. If you select "Alphabetically (Z-A)", the authors will be sorted in alphabetical order from Z-A. If you select "Newest First", the authors who most recently created an account will be ordered first. If you select "Oldest First", the authors who have had an account with Prolific Works the longest (they created an account a long time ago) will be ordered first. Select the "Settings" button on the top of your Reader Library. Under the Settings menu make sure you have selected "Password". You will be directed to this page. Enter your new password on the next line. You must type in your new password again to confirm this change. Once you are done, select the "Update" button on the bottom left of the screen. This pop-up message will appear to confirm your password change. Updating your genre preferences will affect the content shown to you in the "Recommended Books" section of your Reader Library. Please note that changing your genre preferences does not affect your Prolific Works newsletter subscription. Select the 'Settings" button on the top of your Reader Library. Under the Settings menu make sure you have selected "Genre Preferences". Check off the genres that you wish to see more recommendations of. You can return to your Reader Library to see books recommended from your preferred genres. Refreshing the page will give you a different set of recommended books.